Ideally, dig an area one foot deep and approximately 3-4 times the diameter of the root ball. The prepared soil will encourage root growth beyond the root ball and results in a healthier tree. In transplanting from the container to its new home, be sure to keep soil around the roots. Always handle your tree by the root ball or container, not by the trunk or branches. Don’t let the root ball dry out. WATCH FOR CIRCLING ROOTS!!! Help prevent root girdling by vertically cutting any roots that show tendencies to circle the root ball. 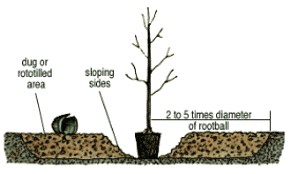 After placing the tree, pack soil firmly but not tightly around the root ball. Water the soil and place a protective 3-foot circle of mulch around the tree. Young trees depend on YOU to help them survive and grow. They will need to be watered, protected, and mulched for at least two years after they are planted. When first planted, your tree will need to be watered at least three times per week, and more through the summer months and frequently through the spring and fall. If you notice leaf wilt, you are not watering enough or deep enough. Also, make sure you water once or twice per month over the winter!